Mineral Exploration: A Short Guide to Understanding the Process – New Age Metals Inc. The process of finding a concentration of minerals is called mineral exploration. Mineral exploration can be complex and has numerous stages; it is often easier to think of it as a cycle. Just as treasure seekers don’t always locate treasures, mineral explorers often do not discover a mineable deposit. For this reason, many exploration programs do not make it through all the stages of the cycle. It is worth noting however, that the programs most often successful are due to the integration of a strong team and the effective development, use and interpretation of data sets. Mineral deposits tend to form in clusters within prolific geologic belts, and exploration typically occurs outward from known mineralization. There are two types of mineral project classifications, ‘Greenfield’ projects and ‘Brownfield’ projects. Greenfield projects are considered the riskiest, as greenfield projects have never had any previous exploration work done on them. Brownfield projects are typically the most highly sought after as they are often located near a mine site, and because of this are deemed to have more potential to become an operating mine. Both approaches require identifying clues over a large area to find rare, valuable and hidden minerals – you never know where the clues will lead. Surface exploration activities occur at the River Valley PGM Project (100% owned by New Age Metals) in this undated photo. Mineral explorers (also called Prospectors) often use planes or helicopters to view large areas efficiently. Aeromagnetic surveys, satellite photos, air photos and detailed maps help prospectors identify mineralization. Sometimes, (as is often the case in Canada) Federal and Provincial governments will conduct basic exploration activity such as aeromagnetic surveys to provide potential prospectors with information. This provides the prospectors an incentive to view the data and consider the possibility of staking claims. Governments appreciate the large scale of economic activity derived from operating mines. Mineral projects can be located on both public (Crown) and private lands, and access is highly regulated by governments at many levels. Before starting work on the ground, it is essential to submit applications for the necessary permit(s) to the appropriate government agencies in order to comply with regulations. In the early stages of mineral exploration, prospectors look in the rocks for useful minerals and other clues to where a deposit may be hidden. Prospectors work together with scientists, including geoscientists, who study the earth’s features and history. Collecting and analyzing this information is called geoscience. 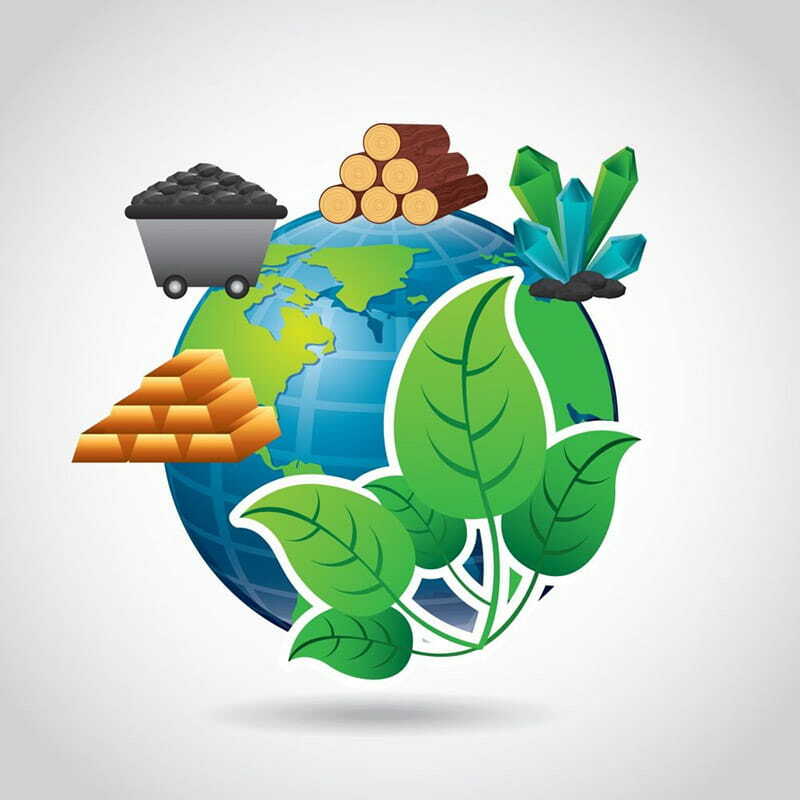 Evolving geoscience, access to the deposit by land, water and air, hydroelectric infrastructure, commodity markets and extraction technologies may all affect an area’s mineral development potential. 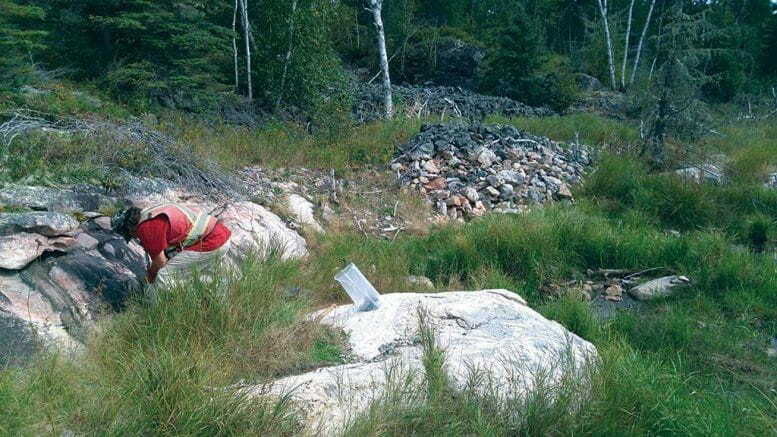 Surface exploration activities occur at one of the New Age Metals Lithium Projects in Southeast Manitoba, ON during the summer of 2018. Prospectors will stake claims, map outcrops and showings, and search for indicator minerals. The goal of the prospecting stage is to find the earliest piece of the exploration puzzle: the clue that there is something much bigger beneath the surface. Outcrops and showings provide prospectors with visible bedrock and allows some initial geological sampling, analysis and interpretation. Indicator minerals are minerals found at the surface that may indicate the presence of valuable ore underground. In the search for minerals, prospectors and geoscientists explore large areas on foot, identifying and mapping locations they have visited, taking small samples of rocks, soils, water, and sometimes vegetation, to be analyzed for clues that could lead to the discovery of a deposit of useful minerals. 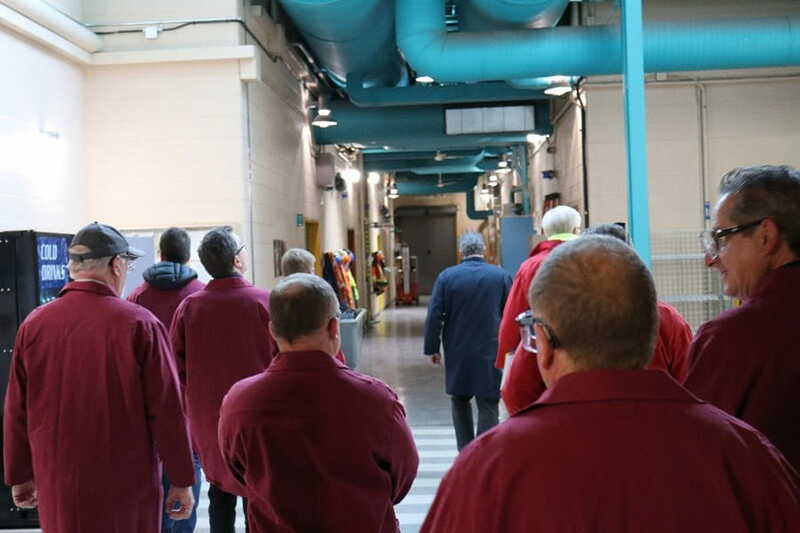 NAM Directors and Management tour the XPS Metallurgical Testing Facility in Sudbury, ON. Photo dated: September of 2018. Corporate Social Responsibility is vital to the success of companies today and encompasses all elements of community engagement. Companies proposing mineral exploration engage many different groups including First Nations peoples, local and regional communities, and governments. Engagement and consultation help companies obtain input, identify potential financial, social and environmental impacts of mineral exploration and ensure that the needs and requirements of those affected are properly addressed. Mineral exploration is expensive and does not generate revenue. Companies that conduct exploration and develop mineral deposits require money – quite often millions of dollars – to complete their work. Companies usually sell shares on equity markets to raise money to explore and develop projects. Sometimes large companies can use revenue from existing operations to finance the search for new mineable deposits. River Valley PGM Project Geologist Richard Zemoroz explains various aspects of the project to local stakeholders as well as investors during the site tour in September, 2018. Investors in exploration companies include private individuals, financial institutions, mid-tier and major miners. ‘Junior Miners’ are what mineral exploration and development companies are often identified as. Often, once a junior miner has identified a resource that can be extracted economically, the leadership will solicit major mining companies that have a focus on the minerals identified and the funds to develop a mineable operation. These partnerships or deals are often lucrative and can provide above-average returns on investment for investors, sometimes multiplying investments 10-fold or more in the short-term. 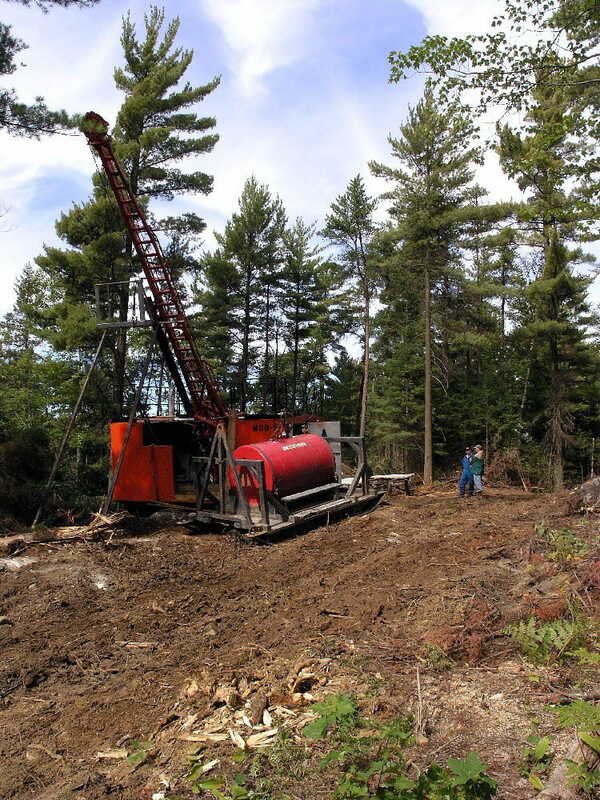 A diamond drill machine drills core on the River Valley Primary PGM Project near Sudbury, ON. Photo undated. This is where the amount of data and sophistication picks up. In this stage, companies are using maps and historical data, geophysics, ground truthing, geochemistry, and trenching to try and identify drill targets. Rock, water, dirt and vegetation samples collected by prospectors and geoscientists can either be tested on site or in laboratories called assay labs. Drilling, metallurgical tests, environmental assessments, 3D models, and mine designs are used to increase confidence in the project. Drilling is done with fairly large machinery that use diamond-tipped, hollow drill ‘bits’ which produce varying amounts of ‘core’ depending on the extensiveness of the drill program. Diamond-tipped bits are used because they can go through the hardest of rock, and the core produced is cylindrical and not typically more than a couple inches in diameter. The details of each drill hole (including direction and depth) are recorded in much detail, each meter of core is marked with the depth that it came from and which hole, if there’s been multiple drilled. Once core has been obtained, samples are then sent to a metallurgical facility to be ‘assayed’, which is essentially measuring the metal contents in the rock. Metal assays are typically reported in units of grams per tonne [g/t], parts per million [ppm] or [%], i.e., a drilling intercept may be reported as follows: drill hole ‘X’ with 1 g/t Palladium over 2 metres. Using this data from the assaying, along with the records of where the assayed drill core came from, the data is re-interpreted to determine subsequent phases of follow-up drilling. If drilling continues, different drilling techniques are used to build confidence in the deposit by determining the size and grade of the ‘strike’ and ‘dip’. The ‘strike is the length and width of the orebody and the dip is the angle at which the ore is leaning towards (if any). Example of a 3D Resource Model. Source: New Age Metals River Valley PGM Project (Outdated Model). The results of a well-funded and robust drilling program can be used to develop a 3D resource model of where and how the ore is located underground. All this information is used to complete an ‘official resource estimate’, which is a non-biased report that is required to have been developed by a ‘Qualified Person’ (QP). The ‘Official Resource Estimate’ will outline the categories of mineral resources (inferred, indicated, and measured) as well as the quantity and grade of each resource category. A QP is a person that is recognized and defined by regulatory bodies as being an expert in the type of geology the project has. The qualified person should be clearly satisfied that they could face their peers and demonstrate competence and relevant experience in the commodity, type of deposit and situation under consideration. Mineral exploration is typically considered a risky business, but there are many experienced teams of professionals that have and continue to reap the rewards of exploring for minerals successfully. The chances of successfully finding an economic deposit of mineral(s) and developing the project are substantially higher when a skilled team is at the helm. For the investor, it is important to understand the process of mineral exploration, and how it can often take years to identify a resource. Returns on investment may take a while to appear. Always research the long-term supply/demand of the minerals being explored for at the company you are considering to invest, and routinely investigate the track record of the company leadership.